A BYU communications professor studies the link between media use and teen eating disorders. Lose 10 Pounds Before Prom! “We’ve all skimmed the headlines while waiting to pay for our groceries,” says communications associate professor Steven R. Thomsen, ’82. While these magazines may provide little more than a check-out line diversion for most shoppers, Thomsen notes that the top women’s beauty and fashion magazines maintain a captive readership of 1.6 million young women each month. Media researcher Steve Thomsen is seeking to understand how popular magazines may contribute to widespread teen eating disorders. Photo by Bradley Slade. “I’ve always been interested in how the media shapes one’s identity, one’s sense of self,” Thomsen says, “particularly in adolescents and teenagers. 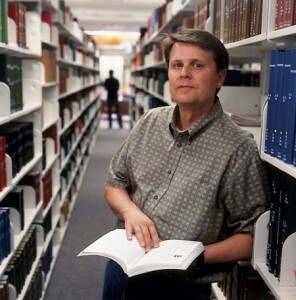 As they develop socially, young people are especially vulnerable to the suggestive ideas that exist in the media.” Although he has also earned grants—including a Fulbright grant to research in Norway—to study how the media influence adolescents’ drinking habits, Thomsen’s most well-known and voluminous research focuses on how women’s beauty, fashion, and fitness magazines help create and sustain eating disorders in some young women. “Many young women who have a steady diet of these publications eventually embrace the belief that social acceptance or desirability is based on their appearance,” Thomsen says. In response, the young women often turn to the magazines to discover what a woman “should” look like. But these images are deceiving, Thomsen says. “Their body shape and proportions are very rare in humankind,” he says, noting that achieving the “ideal” image is often possible only through “airbrushing and medical reconstruction.” Nevertheless, many young women accept these images as the norm, and, Thomsen adds, “they feel like, ‘If I don’t possess that, I had better find a way to get it. '” Failure to attain an impossible ideal can be devastating for some young women, he says, and has led many young women to eating disorders. For some answers, Thomsen approached the Center for Change, an eating-disorder treatment facility, with a proposal to study how anorexic outpatients had used women’s magazines to perpetuate their eating disorders. Predictably, Thomsen found that many of the anorexic outpatients talked about the strong influence of the images in the magazines. Many related that they cut out the pictures of models and pinned them onto their walls or filed them neatly in folders. One young woman described using these cutouts for “comparison rituals,” in which she would look at the pictures and carefully compare her body to the model’s body as a motivation to lose weight. Thomsen was surprised, however, when the young women told him how they responded to articles about the dangers of eating disorders. “I somewhat naively thought that it might trigger a fear in them when they realized they had embraced this extreme behavior,” Thomsen says. But he couldn’t have been more wrong. One young woman reported that she had not been able to make herself vomit, so she scoured articles about eating disorders, looking for hints. “If a magazine said, ‘Bulimia Ruined My Life: A True Story,’ I would read it just to find ideas.” Another girl found the stories inspiring. “If the article said she weighed 88 pounds, then I knew I could do 87,” she said. The media’s approach to eating-disorder education, Thomsen says, is just like their approach to advertising. Instead of focusing on the somber, emotional pain of the girls’ experiences, Thomsen says, the media sensationalize their stories with dramatic statistics and images. But still, Thomsen says, the media can’t be blamed entirely for the prevalence of eating disorders. “People need to understand that eating disorders are extremely complex illnesses—magazine use is just one of many factors that instigate or perpetuate eating disorders,” he says. Consequently, Thomsen focuses his research not only on demonstrating the media’s influence but also on increasing understanding about the deeper psychological factors of eating disorders. In Thomsen’s study of anorexic outpatients, he found that many young women turned into magazines because they were full of simple equations for perfection. Thomsen also found that many young women turned to the magazines for comfort because the slender models and dieting tips counteracted their parents’ and friends’ assertions that they were too thin. “Seeing successful, famous women who are portrayed as extremely thin makes it easier to distort the painful reality of having a psychological disorder,” Thomsen’s research states. The subtle – and not-so-subtle – messages of popular teen magazines create an impossible ideal for young women to compare themselves against, says Thomsen. Photo by Bradley Slade. After nearly seven years of research on this topic, Thomsen remains enthusiastic and passionate about his work. “Eating disorders are a devastating problem that affects a large section of our population. It affects our mothers and our daughters, our friends,” he says. “I am driven by a desire to help the women and their families avoid the pain and frustration that accompany eating disorders. And we have a long way still to go. Liza Richards is an editor for ADP Benefit Services in Salt Lake City.